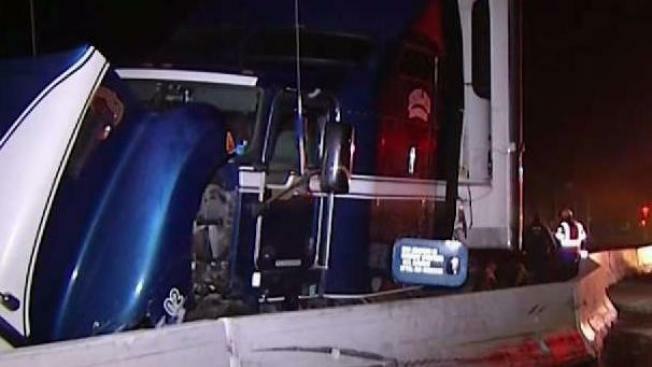 Lanes of northbound U.S. Highway 101 just south of Embarcadero Road in Palo Alto reopened Thursday morning following a big-rig crash, according to California Highway Patrol officials. Bob Redell reports. Lanes of northbound U.S. Highway 101 just south of Embarcadero Road in Palo Alto reopened Thursday morning following a big-rig crash, according to California Highway Patrol officials. The crash was reported at 1:41 a.m. and involved a big-rig that struck the median and a water barrier. The crash resulted in an oil leak and debris in the roadway, CHP officials said. A Sig-alert was issued at 2:16 a.m. because all northbound lanes were blocked, but one lane was eventually reopened to traffic, CHP officials said. All lanes reopened just before 5:30 a.m.